Anyone visiting Bristol City's home ground on match day will be aware of the link between The Robins and The Wurzels. 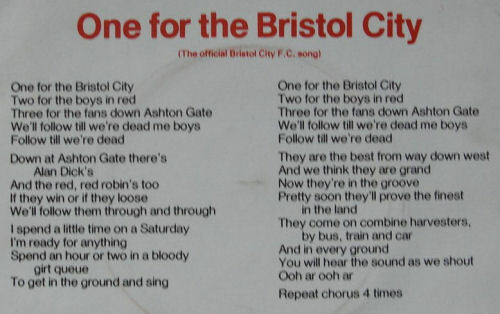 The 2007 re-issue of the Bristol City anthem One For The Bristol City 2007 managed to get into the singles charts, and has already superceded the original 1977 version as the song the team comes out to at all home games. Another song forever linked with the club is Adge Cutler's cider-swilling anthem Drink Up Thy Cider, another favourite for the City fans. But how far back does this love affair go? And was Adge Cutler a die-hard City fan? One For The Bristol City 2007 was re-recorded and re-issued to celebrate the club's promotion from the First Division to the Championship. A single was released on September 24th on CD, as a download on iTunes and was also available as a ringtone. It was produced by Louie Nicastro, and a percentage from all sales proceeds were handed to the BUI Prostate Cancer Care Appeal, a charity very close to Tommy Banner's heart after he was diagnosed with the disease. The single charted in the Official UK Charts for the week ending 6th October 2007, at number 66, but failed to improve on that position and dropped out the following week. It was however the first time The Wurzels had had two singles in the charts in the same year since 1976! In the impressively factually incorrect Adge Cutler Wikipaedia entry, the author claims that "(Adge Cutler)...was a lifelong fan of Bristol City, and re-wrote his band's song Morning Glory to write his team's official song One For The Bristol City, which is played when the teams enter the pitch on both halves of their home games at Ashton Gate." As with much of the content on that webpage, the author has not let the facts get in the way of a good story. Of course all Wurzels fans (or at least those who browse this website!) know that Morning Glory was not an Adge Cutler song at all. The song was written by Guy Fletcher and Doug Flett, neither whom - when they are not penning hits for Cliff Richard, The Hollies and Elvis Presley - appear to be regulars down at Ashton Gate on a Saturday afternoon. And, as this song was released as a single by The Wurzels in 1976, it is quite likely to have been written after Adge's death two year earlier. Certainly One For The Bristol City, which was released in 1977, was not re-written by Adge Cutler. At least, not without the use of a medium! One For The Bristol City (described on the single sleeve as 'the official Bristol City F.C. 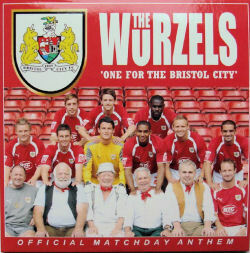 song") was The Wurzels paying homage to their favourite football team, Bristol City. It was released the year after Bristol City had been promoted to Division 1 (what would now be the Premiership) at the end of the 1975/76 season. By 1977 they were established in the top flight, and One For The Bristol City was released as the official club anthem. The song is obviously a blatant show of support by The Wurzels for their home town club. I say 'home town' in the broadest sense of the word. Pete Budd (born in Keynsham) has probably been a City fans since he was a small scrumpybasher. I have my suspicions of the other Wurzels at the time - Tommy Banner (born in Penicuik, a few miles south of Edinburgh) and Tony Baylis (born in London); I have lived in Edinburgh and London over the years, and there were not many City fans around either city! But there is no doubting Tommy's enthusiasm for the club - but then again, he has been living in the city for over 40 years now. One For The Bristol City is not the only Wurzels song to mention the football club. The b-side to the 1977 release of One for the Bristol City was Cheddar Cheese - a Tommy Banner-Pete Budd-Tony Baylis composition which was originally released on the 1975 The Wurzels Are Scrumptious! album. and I think we can certainly presume that this was written by a City fan - or three City fans! I might as well 'as watched the City. This, to me at least, does not sound very complimentary to the club. It sound as if the songwriter - having being turned now by the object of his affections - says that he might as well have wasted his time doing something equally pointless; like watching the City! This doesn't sound like a lyric of a mad-keen City fan. Not necessarily a Rover fan either - more a songwriter who had found a good and relevant rhyme for his song! The song also mentions Ashton Gate which may have been a reference to the football ground, but again is may just refer to that area of Bristol. The songwriters? Adge Cutler and Henry Davies - and one would assume that the those are Adge's lyrics with Henry's music. I'm pretty sure that most City fans would feel that is the City don't win on Saturday then the last thing they want is the Rover to win instead...and Rovers fans feel the same way if they lose. A City fan would have written something like: "...if the City don't win on Saturday, perhaps them Rovers won't neither so at least we won't have them gloating round the office on Monday." It doesn't scan or rhyme, of course - but does reflect the true depth of feeling and rivalry between local football fans! I was rather surprised when City fans Tommy and Pete included Virtute Et Industrial on The Wurzels' A Taste Of The West album in 2004 - but then again, it is another great song! So, Was Adge Cutler A City Fan? So, I believe that Adge Cutler probably wasn't a Bristol City fan. And before the Rovers fans start to gloat - he probably wasn't a Rovers fan either. In fact I would suspect that he was a musician and a vintage car collector, and didn't really care too hoots about football either way! I may be wrong, of course - all I'm going on is the lyrics to two of his songs. (Drink Up Thy Cider) ...was not forgotten when it fell out of the hit parade though. On the contrary, it went on to become the national anthem of North Somerset and continued to be loved and sung by football fans across the region, including those at Hereford, Bristol Rovers and Bristol City. Today, it is the theme song for Bristol City Football Club, sung at every game by the supporters - although in recent times it has been adapted to insult the Bristol Rovers. I wonder if the Hereford fans still sing it? 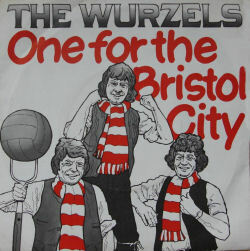 I have always felt the Wurzels were almost synonymous with Bristol City because of the cider and large following of City fans from North Somerset. I remember at a very early age, Virtute Et Industrial being sung well before City's promotion in 1976 in pubs around the ground. I was too young to drink then, but I certainly heard it - but the line was always "If the City don't win Saturday, Rovers never will!" Drink Up Thy Cider has certainly been sung at Ashton Gate since the 1970s, and this season (2007-8), I Am A Cider Drinker seems to be becoming popular. One For The Bristol City was released to celebrate City being in (and doing well in) the top flight rather than an event. City were promoted to the top flight in 1976 so the first full season was 1976/77. The song was released in 1977 and was designated an official club song. More comments and feedback would be appreciated - especially anything correcting any factual errors in the article. I have a few links which might be of interest to readers of this article.